The Biella TT is the shortest stage of the Giro. But the prep for this “race of truth” starts long before the first partenza. Want to see what it takes to get Tinkoff ready? PEZ takes you to the team hotel in Torino. 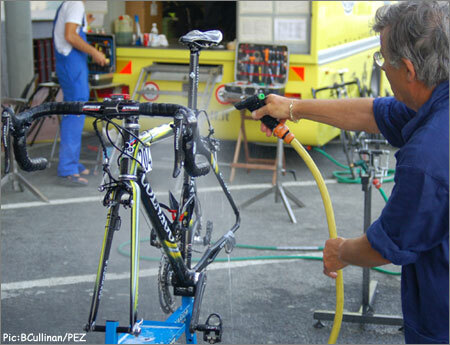 After the brutal battle up the Alps and into Briancon, the Tinkoff team Colnago bikes needed a bit of TLC. The carbon frames are cleaned, the chain is de-greased (and changed if needed), and the wheels are wiped. Everything gets a thorough cleaning…everything including the LAS team helmets. 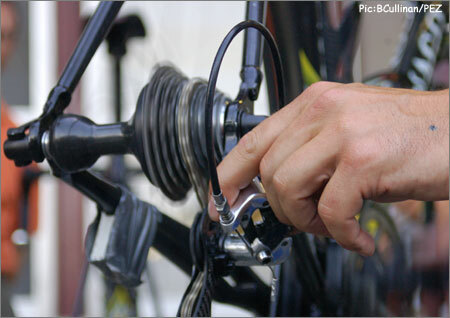 Most of the Tinkoff team will use the same gearing set-up for the uphill Biella TT. Team DS Orlando Maini says they’ll climb in an 11-23 rear cassette on Friday. FYI, They used an 11-25 to climb the Agnello and the Izoard on Thursday. 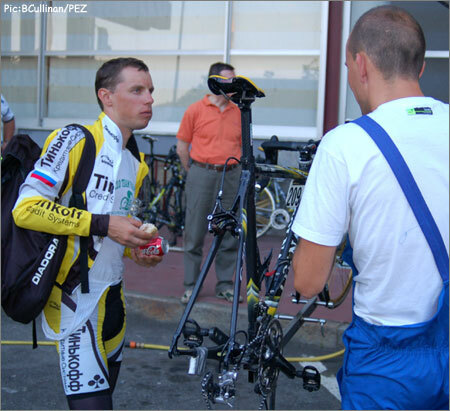 All the Tinkoff guys will ride their regular road bikes in the TT, except for Mikhail Ignatiev. He’s the only Tinkoff rider who insists on using a special bike that’s all tricked out with aero bars and an aero frame. Even on an uphill TT, he thinks it gives him an advantage. Each bike is tweaked and trimmed, each millimeter is checked, and then they’re all put away for the night. Now, the riders have their chance to be pampered. And what better way than with a huge Italian meal? Watching Ricardo Serrano and Pavel Brutt eat is really something. Maini tells me that each guy on his team will put away 150 grams of pasta, 150 grams of meat, a pile of cooked veggies, some bread, and dessert. I made the mistake of trying to keep pace with these world-class eaters. I may never have to eat again. They’ll all have breakfast together in the morning, then each rider will eat another meal about three hours before his individual TT start. 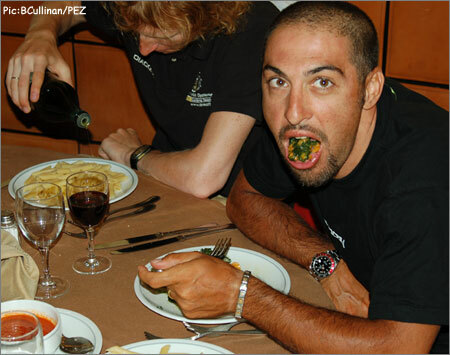 I think Salvatore Commesso is trying to tell us that he’s on a strict “see-food” diet. Nice. Dinner is also the time for the Tinkoff boys to catch-up on the day’s stage results, and start planning for tomorrow. Elia Aggiano and 19-year-old phenom Ivan Rovny check out the time sheet from Briancon. There are two other really cool things about this evening. In addition to the Tinkoff team, both Milram and QuickStep are staying here in this same hotel in Torino. The hotel’s main dining room was divided into three sections for dinner…Tinkoff dined on one side, Milram was on the other, and QuickStep was in the middle. The teams were only separated by the various buffet tables. I saw Paolo Bettini and Alessandro Petacchi bump into each other on the way out…they exchanged pleasant smiles, but little else. Oh, the other really cool thing…Tinkoff DS Orlando Maini says it’s OK for us to drive the PEZ-mobile in the actual TT on Sunday. No kidding. 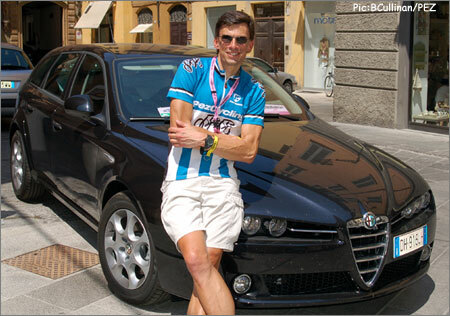 We don’t know which rider we’ll be following up the hill, but look for this black Alfa 159, with my man Mario Luchessi behind the wheel. I’ll be the one sticking my camera out the window to bring all you PEZ-heads the absolute best view of this Giro TT. Is that Vive il sogno, or what? **Very special thanks to LAS HELMETS for setting this up and inviting us all to dinner!